The Bulova Cranbrook C3542 is best selling wall clock we have had in many years. The clock is considered to be a smaller size wall clock in an Old World Walnut traditional case with many features you find on clocks twice it’s price. This wall clock can fit about anywhere and is suitable for a formal area, den or even adds style to a modern kitchen. The antique brass pendulum swings back and forth, but the pendulum doesn’t tick like a keywound clock. The tick is very faint. The Bulova Durant Mantel Clock is this wall clocks sister clock in a mantel clock case. 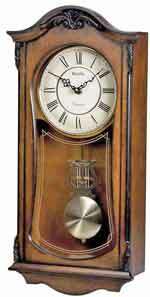 The same design elements are found in both the wall clocks and the mantel clock. 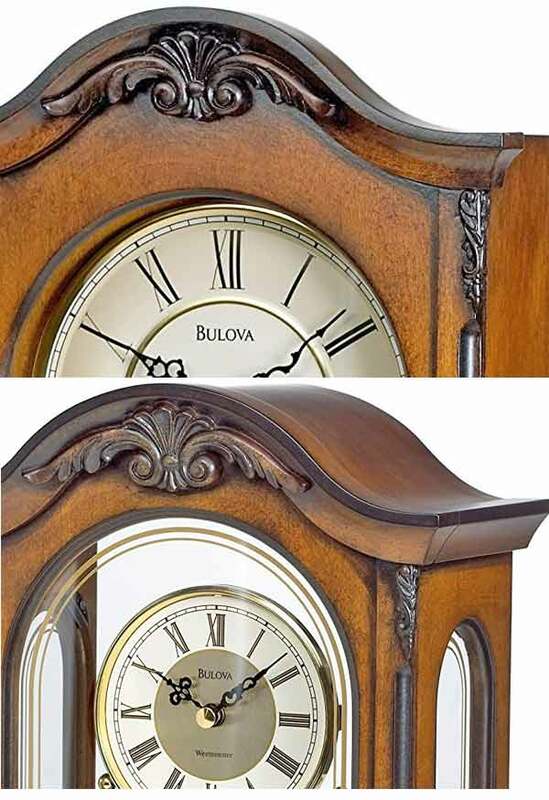 The two clocks have matching finishes in an antique walnut case with an arched top. Decorative carved frontal accents and silk-screened glass fronts are found on both clocks. This clock is small enough to fit in any setting whether on a formal mantel or used as a desk or table clock in a home or office setting. The rotating pendulum moves forward for several turns before coming to a stop and reversing back in the other direction. The images on the left show the Wall clock above the mantel clock where you can see the design elements from one clock to the next. The same design is found on the arched top of the clock with a decorative carved shell molding. Both clocks have fluted front left and right sides at an angle. These clocks are available from The Clock Depot at discounted prices and super quick free shipping.